I was watching Planet Earth II yesterday (brace yourselves), the episode about deserts. Any time I watch Planet Earth, my mind is instantly taken away. If it isn’t the greatest TV series ever produced, I don’t know what is. Aside from the cinematography, which even after you watch the behind-the-scenes continues to bewilder and evade you, it’s really the story-telling that makes it so compelling. What Planet Earth as a series excels at is writing. You can tell they fill in the gaps in a lot of places, but it doesn’t feel deceptive. You know that’s how it really is. And that got me thinking. Dreams are a wild, wild part of biological existence. It’s safe to say we still don’t really know what they’re for. BUT. And hear me out on this. Newly-born mammals take their first breath and immediately know a couple of ground rules. The iguana knows to run up. Even new-born cats know to cover up their poop with dirt. So, there’s obviously information stored and derived from DNA. Instinct seems to be real-life events and useful heuristics somehow imprinting themselves on the DNA. This way, a mammal’s real life experiences (and which predators to stay the f* away from) is loaded up on first launch. You see that image above? If that scorpion were me, I would have nightmares about the flying bat monster every day for the rest of my life. And that’s important for future generations to know, wouldn’t you think? But when exactly is this data written to DNA? 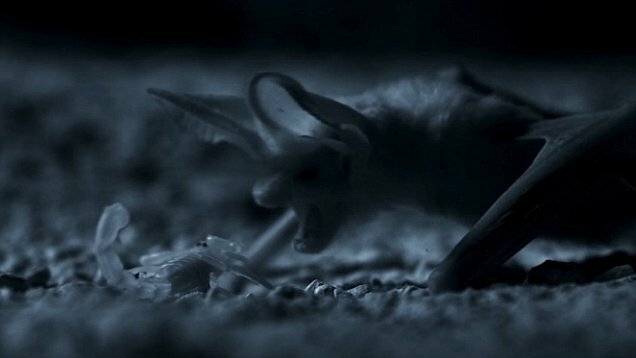 A monster like the long-eared bat comes flying in your face trying to kill you. The experience scars you forever. But in the moment, is it immediately written to the DNA and permanently emblazoned for future generations to be weary of? Or….maybe that’s what dreams are? A transcription process of real-life events to DNA, at which point, the bizarrely compressed “memories” of your life are stored and passed down to descendant generations, helping guide them from day one. Amongst the many things that Planet Earth has illuminated, it has helped me understand one thing very clearly: every living thing is a single-run software program; an executable that runs a non-infinite loop. The program source is contained wholly within, and comes with everything the organism needs to live out a full life (just add water). The locusts which swarm the arid Madagascar south-west after torrential rainfall and instantly devastate any signs of greenery are each single-run software programs that execute their entire lifecycle within a couple days, and then immediately cease function. When reproduction occurs, the software source is copied wholly (and imperfectly), and booted up. It’s clear that the software describes not only physical appearances and traits, but personality, fears, tendencies, and, I’m betting, even nightmares. So that’s my theory: Experiences are contained in our DNA. And experiences are written to our DNA during our dreaming cycles. Now let me just google this..
I’m talking to myself while I work. That’s always a good sign. I’m giddy with excitement at the updates in store for Standard Notes. I’m not usually prematurely optimistic, but it’s nice when things start coming together. Version 2.1 might as well be called Version 3, but, I don’t want to be a version “45.6.8” sort of company. So we’ll be thrift.